During a well-attended ceremony and in witness of the Governor of St. Maarten his Excellency Drs. 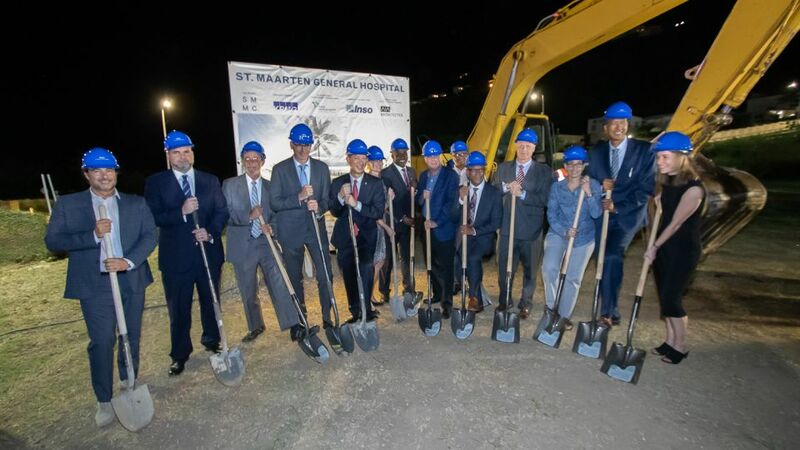 Eugene Holiday, Deputy Prime Minister Wycliffe Smith, Minister of VSA Emil Lee and the Council of Ministers, Dutch Representative Chris Johnson, the Chairman of the Supervisory Council of the St. Maarten Medical Center (SMMC), Robert Jan James, the Board of Directors of SMMC Kees Klarenbeek and Dr. Felix Holiday and numerous Government officials and other dignitaries, ground was officially broken for the construction of the new hospital: St. Maarten General Hospital. The official groundbreaking ceremony was held at SMMC in close proximity of where the new hospital building will be erected during the coming 3 years, which is the area at the West side of the present SMMC building close to the G.A. Arnell Boulevard Road (opposite the Welgelegen Road roundabout). SMMC General Director, Kees Klarenbeek, explained in a detailed presentation that the actual construction of the new hospital will start in March 2019 when soil and site preparations have been concluded: “we anticipate moving into the main building by December 2021 which will clear the way for demolition works to start on the present SMMC building and the additional wing, parking garage and helicopter pad to be constructed. It hurts to have to say goodbye to the present building but Irma has taught us that we need a hospital that can withstand 200+mph winds”.